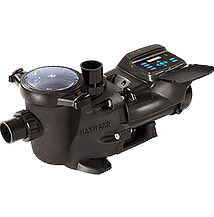 Monarch Pools & Spas will show you the advantages of owning a Hayward Above Ground Pool Pump. Other pumps are available. 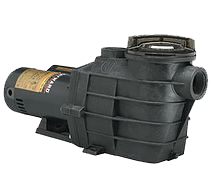 The Power-Flo Matrix® has been engineered as a uniquely superior Above Ground Pool Pump. With a single push of a button, this truly versatile pump changes from a vertical to a horizontal discharge and back again. It’s large profile and integrated styling makes the Power-Flo Matrix a swimming pool pump like no other. The Power-Flo® LX is a high-performance pump series designed for the rigors of Above Ground Pool and On Ground type swimming pools. Combining durable corrosion-proof construction with advanced features and options, Power-Flo LX sets the standard for value and performance. 100% drip proof, heat-resistant double-sized seal for long motor life. Drain plug for easy maintenance of pump. Clear cover lets you see when basket needs cleaning. Super Pump is the world’s best selling pool pump that is efficient, dependable, and proven, setting the standard for excellence and value. Reliability and Performance – #1 selling pool pump. Heavy-duty motor – quieter, cooler operation. Exclusive swing-away hand knobs – easier strainer cover removal for quicker basket cleaning. Faster service -remove 4 bolts to access impeller. 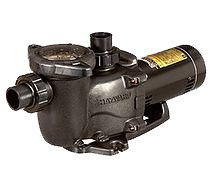 For entry-level new construction and aftermarket applications, MaxFlo XL™ is the medium head pool pump that provides advanced hydraulics and the latest conveniences while maintaining the economy & performance of the proven MaxFlo. 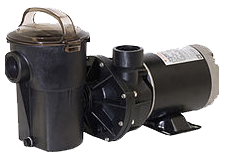 Aligns with the original MaxFlo pump for seamless retrofit installations. Advanced hydraulics for increased efficiency and priming ability. All models include 1 1/2in x 2in union connections to adapt to larger plumbing recommended for greater efficiencies. Optional riser base available to align with Sta-Rite® Dyna-Pro®. Full-flow hydraulics allow greater flow at a lower cost of operation. Heavy-duty, high performance motor with airflow ventilation for quieter, cooler operation. 155 cubic-inch basket extends time between cleanings. Uni-bracket mounting base provides stable, stress-free support. Versatility for any installation requirement by adapting to both 48- and 56-frame motors. ENERGY STAR Certified and compliant with industry regulations including Title 20 and APSP 15; eligible for local utility rebates. Install in any application: in stand-alone mode, with Hayward automation* (including OmniLogic), or with competitive control systems (via relay control). Permanent magnet, totally enclosed fan cooled (TEFC) motor offers incredible energy efficiency and reliability. Fully programmable, digital control interface rotates to four different positions or mounts to the wall for more convenient access and viewing. 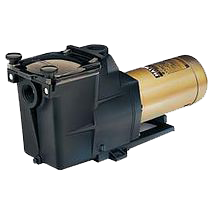 EcoStar® variable speed pump is the most efficient pump at any speed. 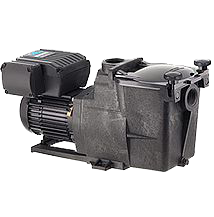 This Pool Pump can save up to 90% on energy costs compared with ordinary singel-speed units. instead of running continuously at maximum power, the EcoStar pump efficiently regulates its flow according to the pool’s requirements at any given time. it is suitable for new construction as well as the aftermarket. Most efficient pump at any speed. Its super-efficient permanent magnet, totally enclosed fan cooled (TEFC) motor and industry leading hydraulic design can save homeowners up to 90% on their energy costs. Service mode allows servicers to clean pools quicker.